As expected, Microsoft put on a strong, games focused show stitched together with “World Premieres” and “Xbox Exclusives”. The elevated applause given to Head of Xbox, Phil Spencer, was in response to his efforts in turning the Xbox One into a robust video game platform instead jack-of-all master-of-none living room media center. But that doesn’t mean that Microsoft is just content with delivering straight games. Xbox’s press conference showed that Microsoft is looking constantly adapt its own ecosystem and offer more ways in which you play games, all in a constant effort to give players the most robust gaming platform available to market. In place of an obligatory Call of Duty campaign demo (which surprisingly had their best E3 showing at Sony’s historical press conference), 343 finally blew the lid off of Halo 5 Guardians’ campaign. 343 did a fantastic job squeezing every ounce of power from the Xbox 360 in Halo 4, and the visual fidelity in Guardians is just as impressive as expected on new hardware. The incorporation of facial capture tech brings Halo into an uncanny valley that the franchise never existed in before. As for the demo itself, it was rather underwhelming. Even as a Call of Duty fan, I could use a lot less ‘Call of Duty’ in my Halo games. The demo didn’t display much of their dynamic enemy encounters, nor did they show any vehicular combat during gameplay. We did, however, get a good look at the previously revealed squad based mechanics, which doesn’t come as much of a surprise since Halo 5’s creative lead is Tim Longo, former creative director of Star Wars: Republic Commando. Whereas Halo 5’s single player demonstration was disappointing, they certainly made up for it in multiplayer with Warzone, Halo’s first 24 player multiplayer mode that looks to quite literally cram nearly the entire Halo experience all in one place. Warzone is not only trying to capture Halo’s big team battles on a much bigger scale, but it also features enemy AI as a neutral force and additional objectives that both opposing teams can target for extra points. Since the Halo franchise has always set the bar for designing intelligent enemy AI in shooters, amidst games like Titanfall and Evolve, Halo 5’s Warzone could be the best integration of combative artificial intelligence in a multiplayer setting. ReCore, much like Scalebound from last year’s E3, looks to add some much needed variety to Xbox One’s line up. There’s not much that we know about ReCore other than what’s shown in the trailer: a young woman traveling a deserted wasteland is accompanied by her canine comrade, a robot whose core can be inserted into other bots that are out of commission. But it’s nice to see project lead Kenji Inafune continue his long standing relationship with Microsoft after Dead Rising and Lost Planet. What’s even more interesting, however, is his studio’s partnership with Armature, the third party developer upstarted by former leads of Retro Studios after the development of Metroid Prime 3. Microsoft even messaged it as such, which shows either a certain level of maturity or desperation that Microsoft is willing to expand the dialogue beyond their brand in order to draw attention to their games. After the premier of ReCore, Microsoft then deviated into some of the crazier announcements of the show, starting with backward compatibility. This is significant for so many reasons. Two years ago we were told these current gen systems weren’t backward compatible; we were told it wasn’t possible. The low return on demand, the technical incompatibility of both the Xbox One and Playstation 4, as well as former Head of Xbox Don Mattrick saying backward compatibility is “backwards”, were some of the reasons behind the decision. Yet, we were shown the original Mass Effect running on Xbox One hardware. Ubisoft even ran along with this bombshell by announcing that Rainbow Six Vegas 1 and 2 will be free with any purchase of Rainbow Six Siege. In spite all of this, this feature could place Microsoft in a weird position where they’ll likely have to get approval for titles they don’t own for backward compatibility support. Companies such as Capcom may not participate in Xbox One’s backward compatibility, since reselling remastered versions of old titles has become part of their business strategy. This also opens up the question for other services on Xbox, such as their monthly Games with Gold offerings and whether or not Xbox owners will have access to both free 360 and Xbox One games, or if we will see a resurgence of Xbox Live Arcade. Nonetheless, combining the messaging of backward compatibility with the announcement of new titles is a smart way of easing the transition for consumers to make the jump from 360 to Xbox One. In their continued efforts to provide players with the “best video game controller on the market”, Phil Spencer followed up with the reveal of the redesigned Xbox One controller. Called the Xbox Elite Controller, it’s going to deliver more than the 3.5 mm headphone jack that we heard of prior to the show. With underside paddles for extra input, hair trigger locks for shorter trigger throw, and an octagonal D-Pad optimal for fighting games (all of which can be completely tweaked and remapped), the term ‘Elite’ is not an understatement. Microsoft is shooting for the pro-gamer demographic with the most customizable mainline controller I’ve ever seen. With the appearance of Fallout 4 on stage, it looked like Microsoft would snag another platform exclusive deal from Bethesda as they have in the past. Well, technically they did, but not in the way we could have imagined. Enter Fallout 4 mod support on Xbox One, where every mod released on PC will become available on Microsoft’s home console. This made it one of the first of what seems to be number of ways Microsoft intends to bring Windows 10 support to Xbox, giving the console a unique form of exclusivity that wouldn’t be possible with any other platform holder. 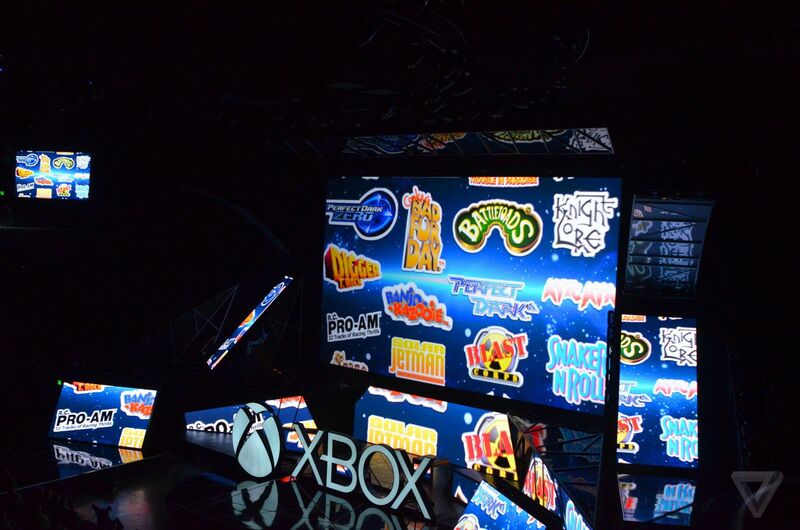 But that wasn’t the only PC feature introduced on Microsoft’s stage. Later in the show, Microsoft would also announce early access support, through the Xbox Preview Program, on Xbox One. At the time of the announcement where gamers could get their hands on The Long Dark, Shelter, Elite Dangerous, and Day Z. Anyone can either jump into an hour long free trial, or purchase the title outright for full access to the game’s early development. In many ways, this was an inevitability as discussions of early access support on console have been going on for about a year. Kotaku’s Stephen Totilo spoke with both Phil Spencer and Playstation’s Shuhei Yoshida last year, picking their brains asking what early access could potentially look like on console. Now that it’s made its way over to Xbox, it’s only a matter of time before Sony will reveal their own early access program as well. Speaking of “access”, Peter Moore took to the stage to remind us of the existence of EA Access, the publisher’s subscription based “VIP” service which gives subscribers access to their (slowly growing) free games vault, and 10% off of purchases and other discounts. It seems that EA REALLY wants players to buy into their program after Moore’s announcement of EA Access’ free week trial for Gold members, and the addition of Titanfall and Dragon Age: Inquisition to the vault. It’s hard to tell if this was indeed a desperate pitch of the program, or a way to prime players for what EA has up their sleeve. But it’s safe to be cynical about it since there was no indication that the EA Access program would expand in any substantial way outside of access to two new titles. Moving onto more games, there’s not much that can be said about Forza 6, The Division, Dark Souls 3, and Gigantic. Forza has over 450 cars and 26 tracks, Dark Souls 3 looks real grim in CGI, and you can expect betas from Gigantic in August and The Division in December. Furthermore, the absence of Remedy Entertainment was strange. Microsoft fans were left hanging after rumours swirled around the Alan Wake IP, as well as a much-needed on update on Quantum Break. The third-person action game, based around the mechanic of time travel, was initially an Xbox One launch title but, much like The Division, has since received several delays . Nonetheless, Microsoft had yet again shown just how hungry they are for more indie support on Xbox One. Having Fullbright’s Steve Gaynor show off Tacoma on stage was a deliberate move, considering that the studio’s first game, Gone Home, is a relative schema when one thinks of indie games. And seeing the stupidly awesome looking Cuphead alongside the beautiful Beyond Eyes is exemplary of the talent that Microsoft’s ID@Xbox program is bringing to their console. All four of their ID@Xbox titles on stage (including the sombre-looking Ashen) looked fantastic and presented very well. This shows that Microsoft has finally nailed giving the indie scene the proper amount of attention they deserve at a place like E3. As the conference moved back to Microsoft’s own AAA titles, Rare’s own moment in the spotlight was enough to make up for being sandwiched between a painfully formulaic Rise of the Tomb Raider demo, and yet another flat and uninteresting trailer for Fable Legends. Rare first started off with something that fans have wanted for several years, a celebration of the developer’s legacy. For Rare’s 30th anniversary, and for $30 USD, Rare Replay will offer many of the developer’s classics such as titles from the Banjo Series, Conker’s Bad Fury Day, Battletoads, and much more. This announcement was immediately followed up by their new title, Sea of Thieves. Despite the painfully generic name (the PUG staff have come up with a series of interchangeable titles such as Walker of Planks and Peg Legs of Eye Patches) Sea of Thieves sets players on a multiplayer pirate adventure filled with tropical island exploration and AC IV-like naval combat. You simply can’t put Rare in a box as a genre developer, and Sea of Thieves looks to support that notion. I know I’m not alone when I say it’s good to see Rare develop “real” games again. The Microsoft conference’s closing was a bit weak, with the official announcement of Gears of War: Ultimate Edition being an HD reboot Gears of War 1 only. There was also a rather bland Gears 4 demo that showed two new protagonists, a new enemy type, but not enough action or graphical showcasing of Unreal Engine 4. While the HoloLens demo wasn’t as concrete as anticipated, it certainly showed us how Microsoft is trying to contribute something new to the ‘alternate reality’ discussion. Just as we’ve seen at its first unveiling, HoloLens was presented with Minecraft on the E3 stage. Like before, the Minecraft demo started on the back wall of the stage where, through a modified camera, the audience saw a projection of the game running on screen. The 2D projection was then taken from the back wall onto a flat table where the surface caved in and erected a fully realized Minecraft space. The impressive demonstration showed the projection being pulled back and forth, whilst viewing inside buildings and underground, too. But, even with all of HoloLens’ bells and whistles, the device seems to be incredibly impractical. Currently, it’s irrelevant to the VR conversation as a “mixed reality” device, especially knowing their direct competitors have VR headsets slated for 2016. Not only that, but I cannot see a huge array of applications that would incorporate HoloLens’ AR projection technology. However, their partnership with Valve on Windows 10 saw no details outside of Kudo Tsunoda’s announcement during the show, and their partnership with Oculus won’t quite offer the experience we’re looking for. For now, Oculus is only bringing a VR “theater” to existing Xbox One titles, which places the player in a virtual room where they can see the game on a bigger flat screen display. Virtual reality is happening, and it’s getting a significant amount of software support from both indie and AAA developers alike. But with the exception of the Wii U, Xbox One is the only platform not set to offer a way to access a native virtual reality experience. It would be wise for Microsoft to rectify that very soon. Backward compatibility, Fallout 4 PC mod support, early access, and even HoloLens all represented ways that Microsoft intends to iterate the user experience. Those were the real show-stealers as nearly all of the showcased games, with the exception of ReCore and Sea of Thieves, have either been formally or informally announced as part of Microsoft’s ID@Xbox program, or as continuations with Xbox’s strong first-party line up. With Gamescom fast approaching in August, we’re sure to see a continuation onto some of the more missed Xbox One titles, such as Crackdown 3. But, within the context of E3, Microsoft put on a solid show.